The Old Kent Picture House was situated at the junction of the Old and New Kent Roads in London, opposite the Bricklayers' Arms Public House. The Theatre, which could accommodate nearly 1,500 people, originally all on one stalls floor with no balcony, opened in February 1910, and was fitted with a Hill Pipe Organ for musical accompaniment to Silent Films. In 1926 the architect Edward Albert Stone enlarged the building by rasing the whole roof by fourteen feet in order to accommodate a new Balcony in the auditorium, rasing the capacity of the house to nearly 2,000 people. A few years later the Theatre was taken over by UPC in January 1928, and they were then subsequently taken over by Gaumont Theatres in July 1930. The Weekly Kinema Guide reported on the Old Kent Picture House and the site's history in their 26th of January 1930 edition saying:- 'The comfortable cinema known as the Old Kent Picture House is situated at the junction of Old and New Kent roads, one of the most interesting corners of London, south of the Thames. Being opposite the Bricklayers' Arms, this site has always been associated with that famous hostelry, and early records show that a well was once situated here where travellers to London stopped to water or change their horses when calling at the inn. Later the site became one of the largest horse omnibus yards in the metropolis, and many of the picturesque "knifeboard" vehicles set out from here. The Old Kent Road, once part of the old Pilgrims Way, has always been in fact, one of the main highways into London and for many years Royal and Illustrious travellers made the Bricklayers' Arms a special halting place for ceremonial entrances to the capital. A special railway station was erected later for the reception of distinguished visitors, and here Prince Albert was received when he first visited Queen Victoria. The Emperor Napoleon and the Empress Eugenie also alighted from the train at this spot, when paying a visit at the time of the Crimean War. The Old Inn however, gave shelter to many celebrities long before the days of the Crimea. In Edward III's reign, the Burgundian knights who came over after the battle of Cressy to challenge English nobility to a tournament at Smithfield, lodged at the first Bricklayers' Arms. A century later, Warwick the Kingmaker, stayed here before going to France to ask the hand of the French King's sister for Edward IV, and during the reign of Henry VIII. Anne of Cleves remained in the inn while her portrait was sent to that monarch for his approval. NELSON, returning triumphant from the Nile, halted here, and other famous admirals who received hospitality at the inn, were Drake, Duncan (Lord Camperdown), Sir Cloudesley Shovel, and Lord Hood. During excavations in this district some years ago, deer antlers, ancient coins, and actual traces of the original inn's foundations were discovered, proving the antiquity of the site. 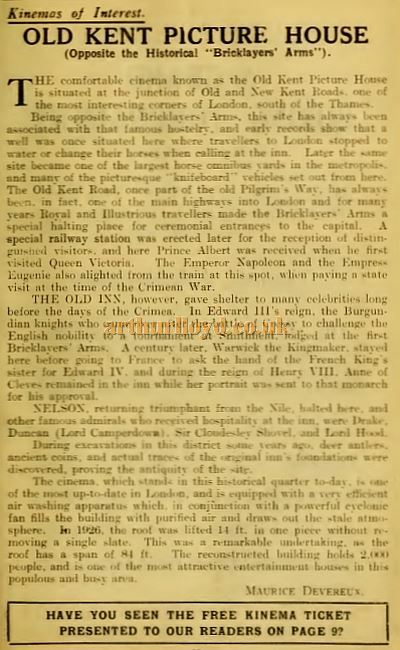 The above text in quotes was written by Maurice Devereu and first published in the Weekly Kinema Guide, January 26th 1930. During the war the Theatre was closed due to bombing but it eventually reopened in 1944. However, its later owners, the Rank Organisation, eventually closed the Theatre for good in October 1956 so that it could be demolished for part of the construction of the Bricklayers Arms Flyover, still there today in 2017, and named after the famous old hostelry. Some of the information for this Theatre was gleaned from the excellent Cinema Treasures Website, who also have an image of the Theatre here.